I liked getting the opportunity to create this mini quilt again, and it was fun to design new interior motifs for the chakras. I still think the yellow chakra is my favorite; it’s just so ornate and interesting and the color just seems to glow from the design. For comparison, here are the two versions side by side (the newest finish on the left and original “Quilt the Life Into It” on the right). The Chakra Mini Quilt finished at 14-inches wide by 45-inches long, and it took me 11 hours to make including design / doodling time. That is so beautiful, and a marathon from go to whoa.!!! Lovely to see them side by side. Yvonne, as always this turned out beautiful. There is such detail in each. Boom! The yellow one really does glow. And the echoing really finishes the whole thing off! Amazing!! The detail, the quilting…it’s awesome. Pat yourself on the back. I really couldn’t pick out my favorite Chakra, they are all amazing! Each one is a work of art! Beautiful finish…and then some! Wow, amazing work. You an inspiration. All I can say is WOW!! What a fantastic piece you have created. This looks amazing! I would like to create something like that for my studio! Same bur different is very interesting to see! Yvonne, this is absolutely stunning! Yvonne, these are truly amazing and I cannot believe you finished one in 11 hours! I would probably still be drafting. Thanks for sharing your process. The detail in these is fantastic , your stitching is so neat . In a more irreverent moment , I thought back to spyrograph – remember that ? What a gorgeous quilt! 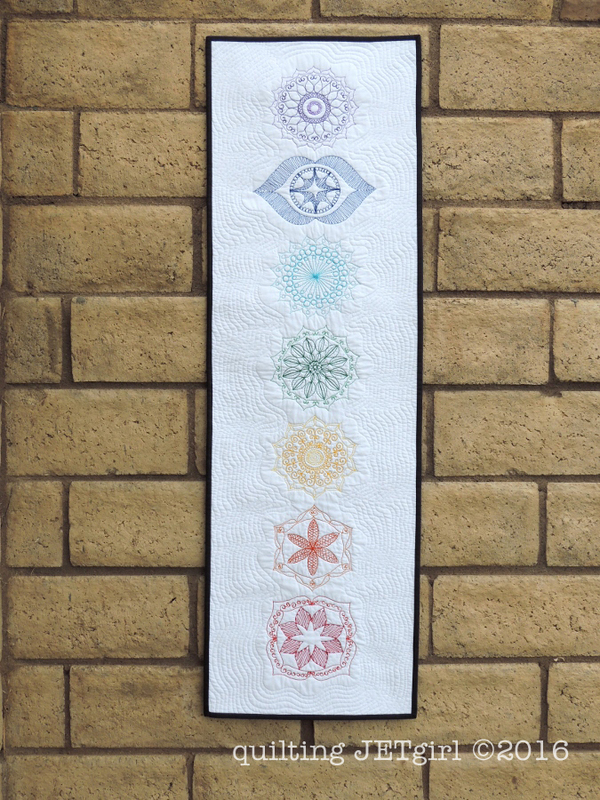 I love how the echo quilting makes the chakras shimmer. This is amazing! I really liked seeing the original and the new version side by side to take in the differences between the designs. Boy you’re good at this kind of quilting! Version 2.0 looks just as terrific as the first time around! Beautiful work. I liked seeing them both side by side. The same, but different. The quilting does make it gorgeous and the design work inside the motifs is quite lovely. It’s so interesting to see the two quilts side by side. They are both beautiful. I like the simplicity of the original but I also like the intricacy of the newer one. What a lot of fun you must have had making each one. I love the challenges you set for yourself Yvonne as the results are so striking. This is simply amazing! I love all the designs but I think you’re right – the yellow one is really gorgeous. Love the texture created with your quilting. Seeing them side by side made me realize the differences. Beautiful finish! This is absolutely gorgeous. I think the yellow is my favorite too. 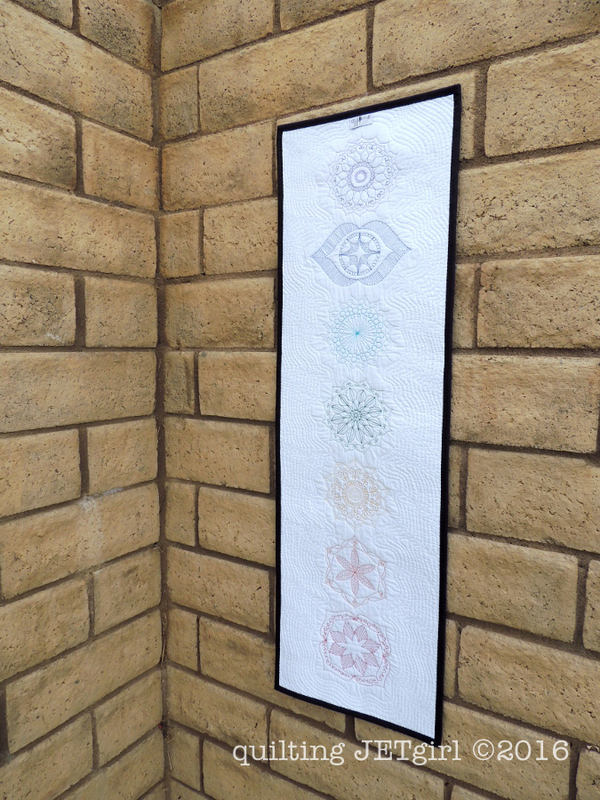 I really liked being able to compare the 2 minis side by side to see how you changed up the quilting for each chakra. I really like the purple and green ones. So beautiful, Yvonne, and fun to see the two versions side by side. I love all of the motifs you chose and how they work together. Yvonne, I finally got a chance to see the quilt on a computer screen. I usually see all my mail on my iphone and it just didn’t do it justice. I am in awe over the stitching you did in this quilt! Your thread work is gorgeous! I can’t imagine changing thread that many times. It’s just beautiful. Great job! I like them both! The blue chakra I think is my favorite, very vibrant. Whole cloth, all thread work is still on my to-do list.